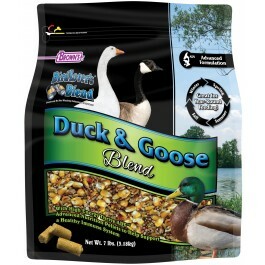 Duck & Goose Blend is formulated with the natural grains waterfowl love to eat. Plus, we have added our nutrition-boosting Thrive ADV™ pellets to provide needed energy for thriving in the outdoors. Brown’s® created Bird Lover’s Blend® for the experienced hobbyist, as well as the novice. This special blend is designed to attract waterfowl such as ducks and geese in all seasons and regions. The experience of six generations has helped the Brown’s® family to develop this product. We know it will bring the beauty of these colorful birds to your backyard habitat and make the bird feeding experience fun and rewarding for the whole family. 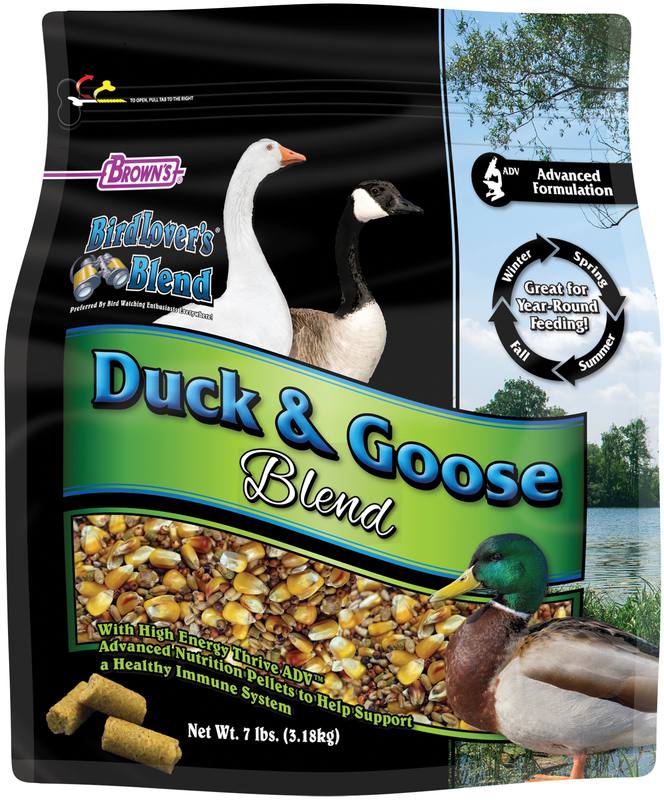 Duck and Goose Blend is formulated with the natural grains waterfowl love to eat. Plus, we have added our nutrition-boosting Thrive ADV™ pellets to provide needed energy for thriving in the outdoors. Thrive ADV™ Advanced Nutrition Pellets are 100% edible and fortified with vitamins and minerals. Each pellet is power-packed with energy that ducks and geese need and seek. We also added probiotics to support a healthy digestive system. All of these key features combine to help support and maintain healthy skin and feathers, strong egg shells, strong bones, and the overall well-being of waterfowl in all seasons, all year-round. Thrive ADV™ Advanced Nutrition Pellets are high-energy, nutrition-boosting pellets that we added to each bag of Bird Lover’s Blend® Duck and Goose blend to help these birds thrive year-round. These advanced nutrition pellets are power-packed with high protein and fats for optimum nutrient absorption. This helps support proper immune system function by promoting good health inside and out. A healthy immune system is key when birds are subject to harsh winters, early spring with no natural food sources, and nutritionally challenged breeding and nesting seasons. Thrive ADV™ pellets assist nature by helping waterfowl flourish in all seasons. Feeding Tip: Provide a generous supply of Duck & Goose Blend year-round to keep the birds in the area. 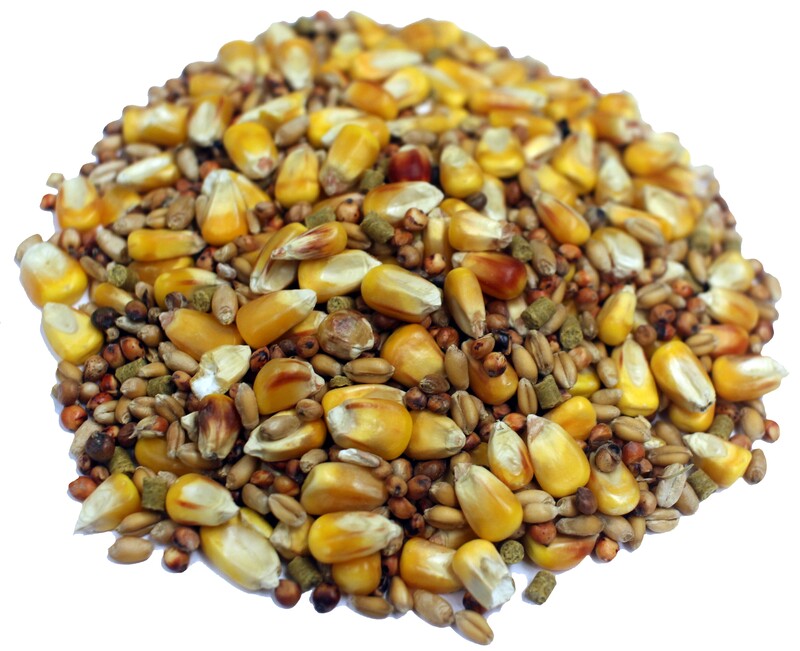 Corn, Milo, Wheat, Dehulled Soybean Meal, Ground Limestone, Corn Gluten Meal, Dicalcium Phosphate, Soy Lecithin, Salt, L-Lysine, Lignin Sulfonate, Soybean Hulls, Choline Chloride, dl-Methionine, Calcium Propionate (preservative), Magnesium Oxide, Ferrous Sulfate, Manganese Sulfate, Zinc Sulfate, Copper Sulfate, Cobalt Carbonate, Potassium Iodide, Sodium Selenite, Wheat Middlings, Vitamin A Acetate, Vitamin D3 Supplement, dl-Alpha Tocopherol Acetate (Source of Vitamin E), Vitamin B12 Supplement, Niacin, Riboflavin-5-Phosphate, Menadione Sodium Bisulfite Complex (Source of Vitamin K Activity), d-Calcium Pantothenate, Pyridoxine Hydrochloride, Thiamine Mononitrate, Biotin, Dried Pediococcus acidilactici Fermentation Product, Color Added (Turmeric), Potassium Chloride, Yucca schidigera Extract, L-Ascorbyl-2-Polyphosphate (Source of Vitamin C). Pediococcus acidilactici (min) 1,000,000 CFU/lb.